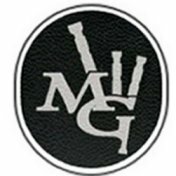 The charts below provide guidance on taping and undercutting for tuning a chanter. 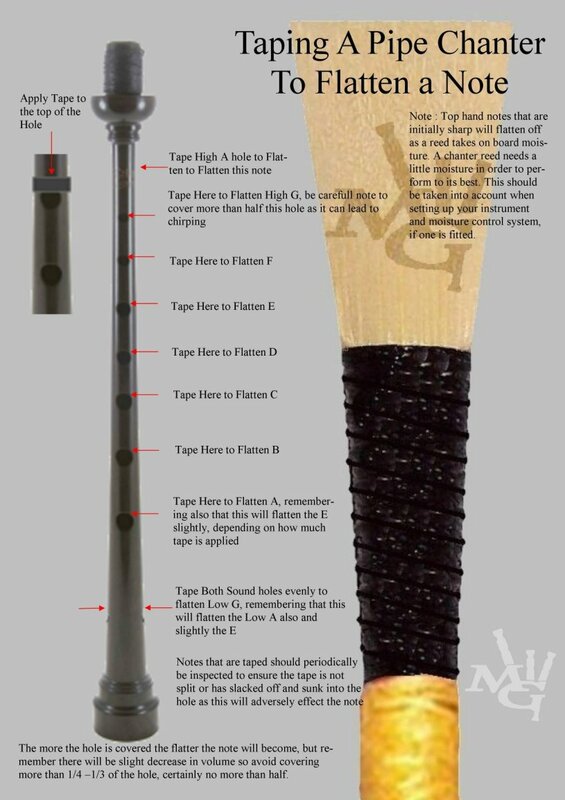 Taping is very straightforward however be very careful if you decide to undercut a tone hole. If at all uncertain then seek professional advice. An important point to remember when tuning a chanter is that the tape on the sound hole will affect the low A and tape on the low A will affect the E. The effects are slight and depend on the amount of tape. When you tape the sound hole, it will also start flattening off the low A, because of this and the drones being re tuned to the low A the rest of the notes will in effect sharpen. Here is the confusing part. 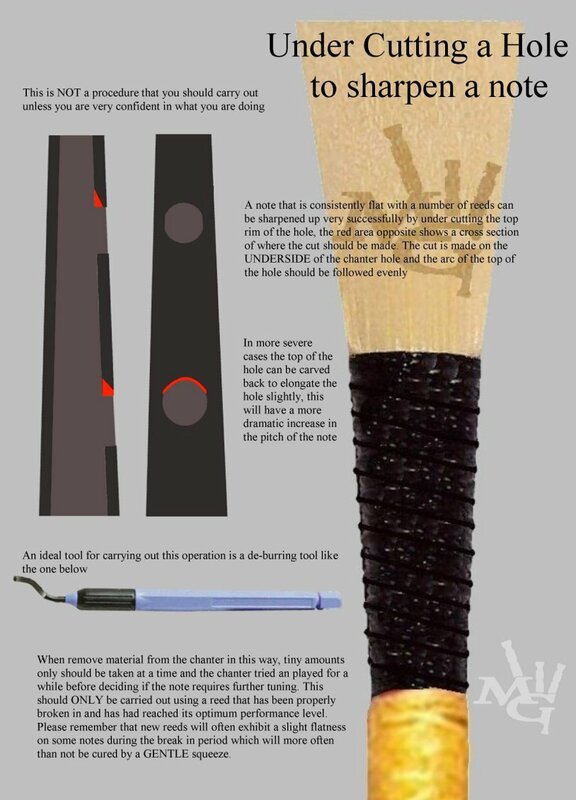 As the amount of tape increases on the sound hole it will also start to flatten the E. This flattening of the E will be at a greater rate of the effective sharpening due to the flattening of the low A. Yes read that again it is confusing. Do not attempt this unless you are confident in what you are doing. If in doubt seek professional advice. Should a note be consistently flat with a number of different reeds from a number of different makers then you should consider undercutting it to sharpen it. Be sure this flatness is inherent in the chanter and is not due to under blowing a reed. See also chanter reed manipulation. There are different tools available that will carry undercutting very effectively. Blackwood is very hard and metal working de-burring tools are ideal for this. When undercutting, remove the wood (or plastic) from the inner, upper side of the tone hole at an approximate angle if 30 degrees. This will preserve the shape of the tone hole. The chart below provides further guidance.